In a shocking revelation, the Inspector General of the Department of Health and Human Services (HHS) says that not only were “thousands” more migrant children separated by the Trump administration than previously known, but that they didn’t even know how many children were taken away from their families because of failures to track families as they were being separated! 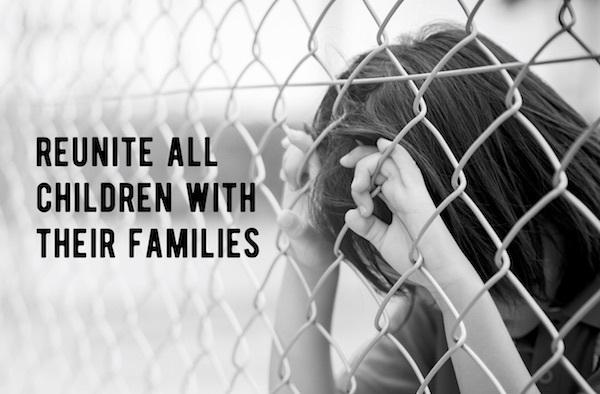 Sign on to tell Congress and U.S. Secretary of Homeland Security Kirstjen Nielsen to immediately end these cruel policies and practices, and reunite every child! As mothers and people who care deeply about children, we are horrified that our government has forcibly separated thousands more children from their parents than previously known, and that the exact number is still unknown because our government failed to track families as they were being separated. These cruel practices are a shocking moral failure of our government, inflicting deep trauma on already vulnerable children. The anxiety and distrust children suffer when they’re institutionalized away from loved ones can cause long-lasting mental and physical health problems, particularly for small children who need personal attention in their formative years. We believe that families belong together, children deserve to be with their families outside of cages,and they must have their rights protected. Reunite families now. The administration must stop separating children from their parents and immediately reunify those that have been separated. End family detention. Children and families deserve due process, not indefinite imprisonment. Children do not belong in baby cages and internment-like camps. Family incarceration is not the solution to family separation. End “prosecute everyone.” The Trump administration must reverse their “zero tolerance” policy that created this crisis that resulted in thousands of children being separated from their parents.